The neighborhood of Fenway-Kenmore is actually made up of several sections: East Fenway, West Fenway, Audubon Circle, and Kenmore Square, and are usually referred to separately as “the Fenway” or “Kenmore.” Charming brownstones and brick walk-ups alternate with small independent businesses throughout the neighborhood, and more recent, larger developments such as the Landmark Center also make this a convenient place to live. The area includes the Longwood Medical area, the famous Fenway Park and its surrounding commercial district, and large parts of Boston University, Northeastern University, the Berklee College of Music and the Boston Conservatory of Music. 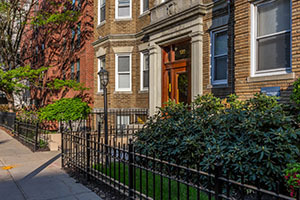 A large number of students live in the Audubon Circle area and throughout Kenmore, and the Fenway teems with life during the spring, summer, and early fall in Red Sox season. Numerous other well-known sites dot the neighborhood, including the Citgo sign, the Art Institute of Boston, The Museum of Fine Arts, and the Isabella Stewart Gardner Museum. Contact us to ask questions or schedule a tour, or scroll down to browse properties and homes for sale in Fenway/Kenmore, MA. Register with us to save your favorite Fenway/Kenmore real estate listings and get notified when similar properties become available. Welcome to 39 Hemenway St #26 - LARGE NEWLY RENOVATED 3 BED/2BATH 1370 sqft in East Fenway (Back Bay Side- 1 block off Mass Ave) AAA+ LOCATION. This large condo is on a charming residential street. It features a large OPEN PLAN living room/dining area with lots of windows, an open-ended kitchen with a large island, hardwood floors, CLOSETS/STORAGE galore, recessed lighting. Modern TWO FULL BATHS feature porcelain tiles, frameless glass shower doors & floating vanities. w/d in building. Walk to Back Bay, Fenway neighborhood, Wholefoods, Café Nero, Starbucks, DD's, shops & restaurants, The Prudential Center, BSO Symphony Hall. Perfect for Northeastern, Berklee Sch Music, Conservatory, Wentworth, Longwood LMA. Convenient for commuting using public transportation- the Green line T, Bus #1 to Cambridge. Good rental area. Can be delivered vacant... THREE LARGE BEDROOMS & TWO BATH - PERFECT FOR ROOMMATE SITUATION. Prof managed, Cats only. FENWAY PRICE FOR BACK BAY LOCATION. Live at the recently constructed Mosaic just steps from Longwood Medical! Stunning condominium featuring a floor to ceiling wall of windows with breathtaking southwest views of the Emerald Necklace. This sun filled home features an open floor plan, luxurious kitchen with a granite island, gas cooking, stainless steel appliances, & large cabinets for extra storage. Many other attributes include beautiful stone bathrooms, highly efficient heating/cooling systems, & in-suite laundry. The Mosaic is a LEED Certified building and features an elegant lobby, community kitchen, elevator, club-room, bicycle storage, top floor fitness room & outdoor grilling station. Extremely well located next to four major medical centers- Brigham & Women's Hospital, Boston Children's Hospital, Beth Israel Deaconess Medical Center, & Dana Farber Cancer Institute and steps from Harvard Medical, MCPH, and Harvard School of Public Health. The Mosaic- if you work at Longwood Medical....you'd be home by now! Elegant marble lobbied entrance in elevator building located in the Back Bay Fens sited on The Emerald Necklace. Front facing with bedroom views of the park. Living room and kitchen windows lookout onto courtyard. Sunny huge 1 bed 1.5 bath home lovingly renovated in 2000 features high ceilings, hardwood floors throughout, updated kitchen, tremendous storage thorough out with built in bookcases, custom cabinetry, a walk-in closet 6 x 6, and a white marble spa like bath. Key less entry building. Laundry on-site. Extra deeded storage. Highly desirable Back Bay location with Whole Foods, Museum of Fine Arts, BU, Simmons, Emmanuel, Northeastern, MA College of Art, Forsyth School of Dentistry, Wentworth Institute of Technology, Symphony Hall and all the Hospitals adjacent. Professionally managed Two(2) building association 70 & 74. Current reserves $31,900. No planned work or special assessments pending. Pet friendly NO Smoking Building. Seller will Close 6/25/2019. Available ASAP. 1st floor high traffic area retail/office space in Kenmore Square. Big bay windows with great visibility. 527sf divided into one large front room, back office, HVAC closet and bathroom. Bamboo flooring. HVAC installed 2014. NO Food, NO Odors. Not zoned for restaurants. Listed by Justin Grammer, A & S Realty Co., Inc.
Renovated one bedroom condo located in an elevator building in The Fenway. A Park Drive split layout on the fourth floor with high ceilings, all hardwood floors, and plenty of sun light. The kitchen features granite counter tops, gas cooking, stainless steel appliances, and a custom tile back splash. Recently remodeled bath includes contemporary finishes, custom tile and deep soaking tub. This professionally managed elevator building has common laundry and bike storage. Easy access to public transportation, shopping, restaurants, Longwood Medical area, Kenmore Square, and several local universities in Boston's desirable Fenway neighborhood. Unit is rented until 5/31/2019 for $2350 a month. Bright, sunny two-bedroom penthouse condo ideally situated on quiet, tree-lined street in Boston's Fenway neighborhood. Minutes to thriving Longwood Medical area or Landmark Center. Short stroll to Coolidge Corner where cafes, shops and restaurants abound. Enter welcoming foyer. Entertain guests in your spacious living room, or spend a quiet night by the fire. Step into formal dining room, leading to crisp white kitchen with granite counters and stainless appliances. Step out to your private deck to enjoy the morning sunlight or a balmy summer evening. Serene master bedroom plus generous second bedroom, both with custom closets. Abundant sunlight streams in thru your windows. H/W floors. Everything Boston has to offer within reach. Fenway Park, Museum of Fine Arts, Symphony Hall. Short walk to Green Line's C and D lines and within minutes Copley Square, Newbury Street and more. Easy access to major highways. Parking, extra storage, laundry and roof rights. Your ideal city home awaits! Rarely available luxury condo in the Longwood Medical area near the Brookline town line. This condo features NEW floor, carpet and paint! Incredible light and air give this home a spacious feeling for all that enter. The open floor plan and glass window wall showcase spectacular views of the Emerald Necklace. Home is LEED Silver Certified. All baths are tiled & kitchen have granite counters and all GE Profile Series stainless steel appliances and Asko stackable washer and dryer are included.This home includes two garage parking spaces. 11th floor amenities include club room with large outside terrace and grilling area and fitness center. On the 1st floor, there is a club room/meeting area, additional laundry facilities, mail/package room, and bicycle storage. This gorgeous new condo is waiting for you to move in! Open house Sat/ Sun 12-1pm. *One of a kind opportunity in the Fenway* in a beautiful and professionally managed building. Price includes **TWO EXTREMELY RARE DEEDED PARKING SPACES* viewable and easily accessible from the unit. One bedroom, one bathroom condo with gleaming hardwood floors throughout bedroom and common area, tile kitchen and bath. Washing machine in kitchen, and common laundry/covered bike storage downstairs. Soaring parlor ceilings, and western-facing bay windows for excellent natural light throughout the day. Great kitchen pantry, hallway storage and bedroom closets with several built-ins. Recently renovated and meticulously maintained by owner occupant for many years in a building with many recent upgrades, including re-pointing, new roof, gas lines, boiler, and entrance. Across from the MFA, Emerald Necklace, rose/public gardens, and around the corner from Fenway Park, Longwood Medical, universities, public transportation, grocery/department stores, movie theatre, restaurants and more! Rarely available two-bedrooms plus den, two-bathroom unit in a luxury Mid-rise building with an assigned garage parking space. The kitchen, with stainless steel appliances and granite-topped breakfast bar, opens to a dining/living room with abundant natural sunlight streaming from the large sound-blocking windows. The designer bathrooms each offer a soaking tub/shower combination. In-unit washer/dryer hook-ups. Amenities include an elevator, central heat and air-conditioning, extra storage, an exercise room, and a well-run, professionally managed association. Located in the heart of Boston, surrounded by the B.U. Campus and the Fenway/Kenmore/Brookline area with restaurants, various shops, movie theatre, public transportation and easy access to major highways.